Everything She Wants is a very impressive debut novel. Kudos to Sarah Alva for writing an entertaining story with great characters. My attention was captured right off and held throughout the story. This is a good, quick read, and I was very interested in the decisions Lucy would make. She was torn between being herself and having the life she expected (and thought she wanted). I really liked Emerson and his story was captivating. So many times it’s easy to be judgmental, but it was good to be reminded that we are all sinners and need the atonement. The author did a great job of including faith and religion without it being disjointed or preachy. It was very much a part of the main characters' lives and the religious parts flowed well. I don't always look for a message from the novels I read, but I came away from Everything She Wants thinking it was about doing the right thing for the right reason. That is definitely something to take a step back and consider in our lives. Looking at Charles and Lucy's relationship from an outsider's perspective, it is so easy to see how awful of a person he is. Maybe not quite to the abusive level, but only one or two steps away from it. I'm not sure why Lucy couldn't see how bad he was for her...everyone else around her could...maybe it was because she had so little self-esteem that she thought he was the best she could do. It took Lucy a really, REALLY long time to finally figure out what was important to her, and to finally stand up for herself. Charles is definitely the character that you love to hate. Emerson, on the other hand, is just a good guy. Yes, he's working through a lot of issues. But he's honest enough with himself to know that he can't rely on Lucy's testimony to get him where he needs to be. He gets major kudos from me for that. The relationship between Emerson and Lucy developed a bit fast for me (if you haven't noticed in any of my other posts, I like the slowly developing relationships better) but I guess it kind of had to, since they only had a few days together in London. Probably my favorite character in the book was Emerson's dad. Such a fun, quirky guy, but so accepting and full of wisdom. Isn't the cover of this book beautiful and totally eye catching? 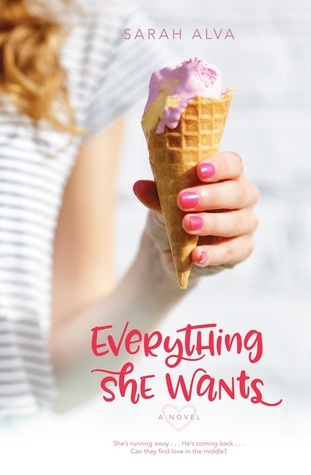 I love the color scheme, I love the font for the title, and hey, it features ice cream. Yummy! This is a book that I would pick up off the shelf just because of the cover. While that's totally judgemental it's also a theme I found in this book. Lucy was very accepting and open to Emerson. I think that's wonderful. I think we find too many expectations of cookie cutters, and that can be super damaging for everyone involved. Especially if you don't fit the cookie cutter mold. I think it's important to realize the atonement is for all of us and that God loves all of His children. This is a wonderful, clean, debut novel. I would definitely read something else from Sarah Alva.